Image courtesy of the Library of Congress John C. Calhoun of South Carolina served as Representative, Senator, and Vice President. Calhoun resigned his position as Vice President to return to the Senate in 1832. On this date, the Tariff of 1828—better known as the Tariff of Abominations—passed the House of Representatives, 105 to 94. The tariff sought to protect northern and western agricultural products from competition with foreign imports; however, the resulting tax on foreign goods would raise the cost of living in the South and would cut into the profits of New England's industrialists. Nevertheless, President John Quincy Adams approved the bill on May 19, 1828, helping to seal his loss to Andrew Jackson in the 1828 presidential election. 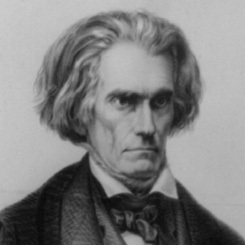 Later that year in response to the tariff, Vice President John C. Calhoun of South Carolina anonymously penned the South Carolina Exposition and Protest, articulating the doctrine of nullification. The doctrine emphasized a state’s right to reject federal laws within its borders and questioned the constitutionality of taxing imports without the explicit goal of raising revenue. Calhoun later took credit for the doctrine in 1832 to the detriment of his presidential ambitions. Following their statesman’s lead, the South Carolina legislature used Calhoun's reasoning to nullify the Tariff of 1832, which had earlier replaced the Tariff of Abominations. While other southern states disagreed with the tariff, South Carolina was the only state to invoke nullification. Following a few tense months, South Carolina eventually accepted a compromise tariff in the winter of 1833. The constitutional crisis was only temporarily averted, as tensions remained throughout the Union.